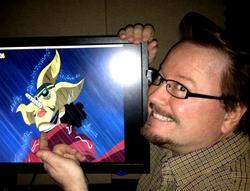 As a voice actor, Strait is considered to be one of the most recognized in the business. Besides Dragon Ball Z, he has worked on many popular animated series including Usopp in One Piece, Maes Hughes in Fullmetal Alchemist, and Cartoon Network's laid back, robot host Toonami TOM. He has also worked as a writer and director on several TV series including Dragon Ball series, Case Closed, and Lupin the Third. As a comic book artist he has 17 published works to date including his débuted self-published series Mr. Average featured in The Comics Journal and Elfquest which was published by both WARP Graphics and DC Comics and he's considered one of the top Elfquest artists from its over 30 year history. He has also appeared in many video games such as the title role in S'plosion Man, the psychos in Borderlands and Neptune in Smite. In 2015 Sonny returned to directing starting with the anime series Maria the Virgin Witch, Mikagura School Suite and the highly controversial Prison School. He has also returned to Elfquest as a colorist for Dark Horse Comics, and did a Ford commercial as Krillin! Recently he was announced as the ADR director and the new voice of Allen Schezar for the FUNimation redub of The Vision of Escaflowne.